Luxury motor yacht CARRARA is a 2005 26.21m (85' 11") Amer charter yacht as designed by naval architect Andrea Bacigalupo with interior design by Profilodesign. 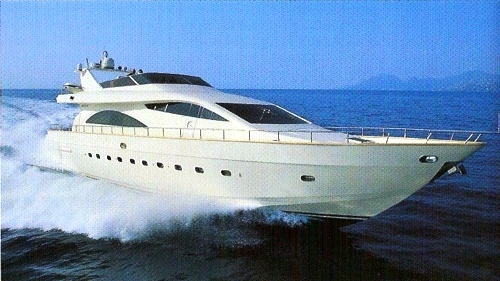 M/Y CARRARA is available for yacht charters throughout the Mediterranean Sea. 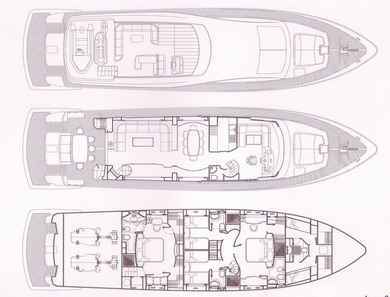 There is accommodation for 8 in 4 ensuite cabins, all fitted and furnished in CARRARA white textiles, cherry wooden panels, and bathrooms in grey marble. 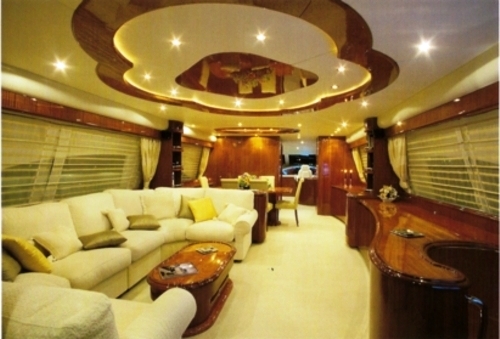 Just behind the bridge, a stairway leads to the VIP cabin and the two guest cabins. 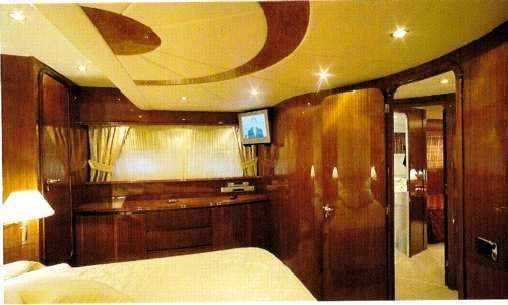 The VIP cabin, located from the middle of the boat, is full beam like the owner's cabin and has no reason to envy the latter for spaciousness and fittings with its own bathroom and separate shower cubicle. The two guest cabins are perfectly symmetrical and have twin beds private bathrooms with separate shower cubicles. 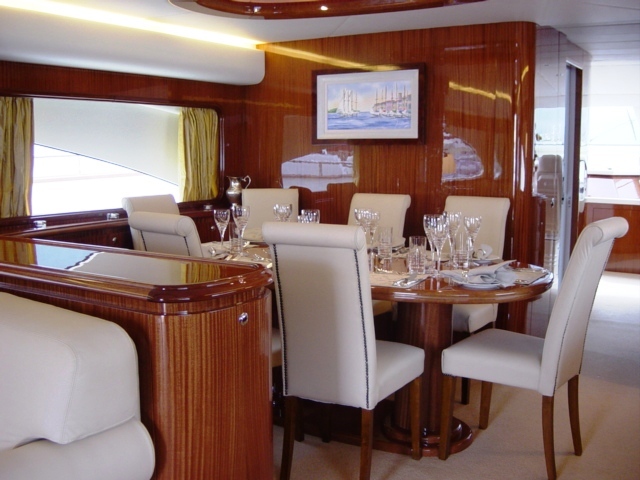 CARRARA is in pristine condition throughout with excellent deck spaces and wonderful performance. 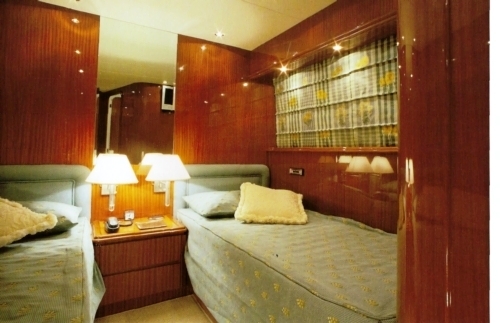 Luxury motor yacht CARRARA provides yacht charter accommodation for 8 guests in 4 ensuite cabins in the following format: All fitted and furnished in Carrara white textiles, cherry wooden panels, and bathrooms in grey marble. 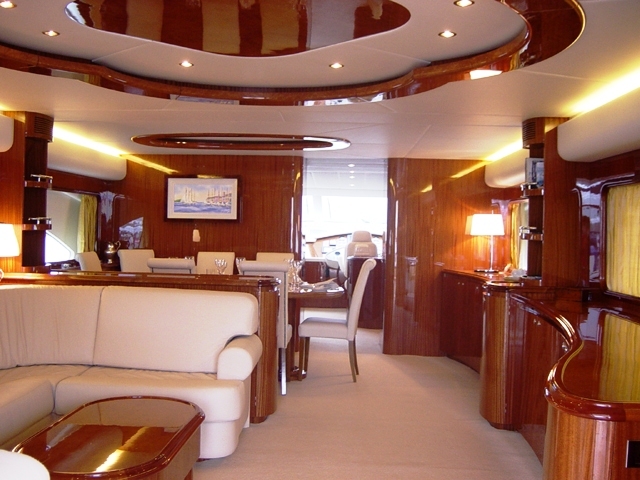 The full width owner's cabin is located midship with independent access from the salon. 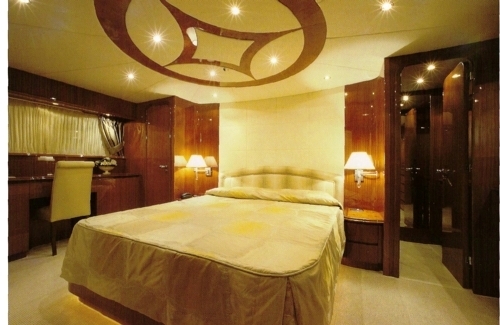 It is equipped with a fridge minibar, 17" LCD TV, air conditioning, safe and palatial bathroom. 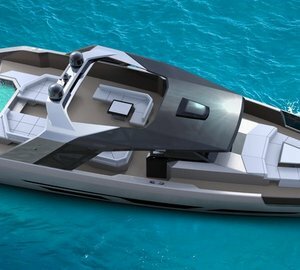 Luxury motor yacht CARRARA offers the following water toys and amenities for your luxury yacht charter vacation: Tenders & Toys Novamarine RH 400 GS , with Yamaha F40 Jet SEADOO 3D Premium 2004 Yamaha combo skis 1.4m Ski biscuit Inflatable 2 person canoe 2 Fold up bicycles snorkeling equipment. Audio Visual Equipment and Deck Facilities . 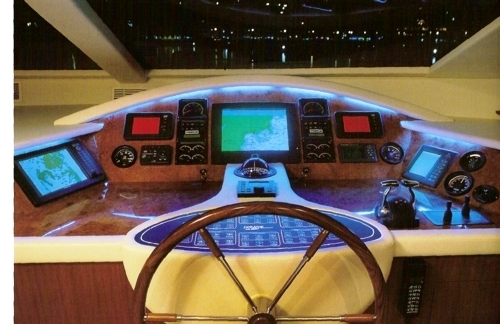 Intercom in all cabins and saloon • GSM phone installation with separate antenna on the fly • VHF equipment • Satellite antenna with decoder and dvd in salon • Ultra flat LCD 17’’ monitor with decoder and dvd in each cabin • Dolby surround in saloon • Saloon VCR • Stereo CD unit in all cabins. 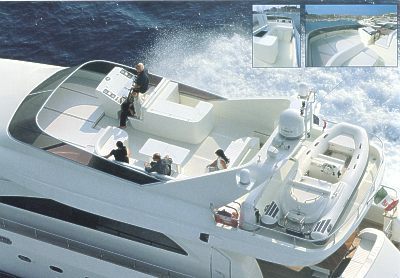 Amer’s passion for the sea as well as his ongoing research in different innovative technologies led to the design, development, building and construction of his own line of motor yachts, luxury yachts and super yachts which later on have dominated the boat market under the brand name Amer.